I’ve been listening to Halo by Beyonce lately because of that part in Girls where Hannah does the dance from the video. I’ve been sleeping in as late as possible before work. I’ve paid too much attention to my snooze button. I’ve worn hot pink pants, and called my mom because I miss her. And I’ve made you guys this cornbread. 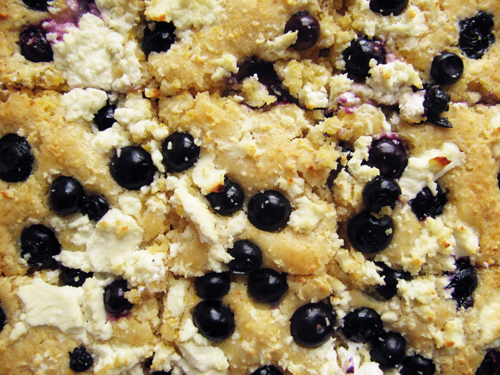 I sprinkled it with giant sweet blueberries* and crumbled goat cheese. I’ve eaten it for breakfast, and snacks. *I impulsively bought 2 lbs. of the berries at Trader Joe’s. The maple syrup subtly makes this cornbread a breakfast dream. Although, I personally think this would be an awesome thing to bring to a BBQ. The star of the sides! The king of the cornbreads! P.S. 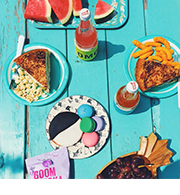 This polka-dotted stuff might steal the thunder from the smokey meats and such. So, beware, it could cause trouble of the delicious variety, but come on… it’s not like those grilled things are getting married and this cornbread wore white to the BBQ, right? Preheat oven to 400 F. Grease and 8 or 9 inch pan. Place maple syrup in a 2 cup measuring cup and fill to the 1 cup mark with milk. Whisk in oil and egg. Stir into the dry ingredients. Pour batter into prepared pan. 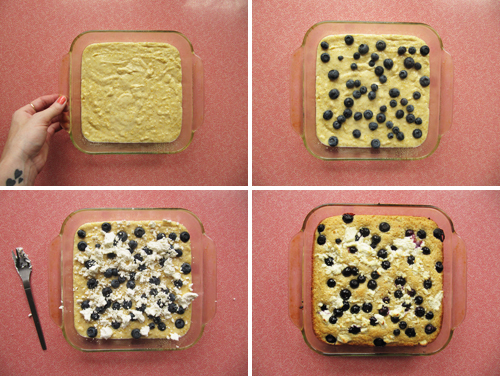 Sprinkle with blueberries and crumbled goat cheese. Bake 20-25+ minutes or until light gold brown and toothpick inserted in the center comes out clean. It’s soooo funny cuz I have halo stuck in my head right now and it’s because I subscribed to your spotify playlist. HAHAHAHA and then I see my name on this bread and I felt like you could see me blasting that song in my office or something. Halo shout out in the next podcast! And is it weird that I’m imagine pulled pork sandwiched in between two slabs of this? Yeah… I went there. Yes! haha I just heard it playin’ from your house, girl! I want to make this, cut it into slices, put bacon between the slices… then cover it in whipped cream. Wow. Can you tell it’s an eat day for me? And yes! Bacon would be perfect on this shtuff. Yum, I will make this. I recently learned that I really like goat cheese =). 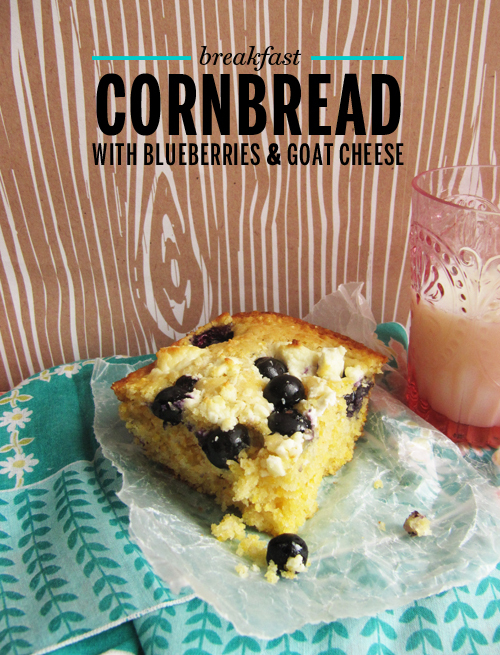 Cornbread is always a favorite! Thank you. Oh good, Mark! Goat cheese makes everything better! TJoes also had 2 lb tubs of blueberries for sale near me and I talked myself out of buying them. Now I think I might have to go back and see if they’re still there. I just can’t contain myself around those good-lookin’ berries. i have been listening to that robyn (!) song ‘dancing on my own’ NON-STOP since hannah and marnie were dancing around to it on girls! Oh! I’m going to listen to that now! No Joke, I totally wanted a blueberry muffin this morning on my way to work. Also No Joke, Beyonce is excellent kitchen music. 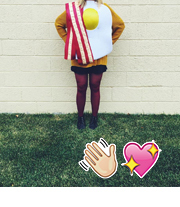 We’re really serious about breakfast foods and Beyonce, right? 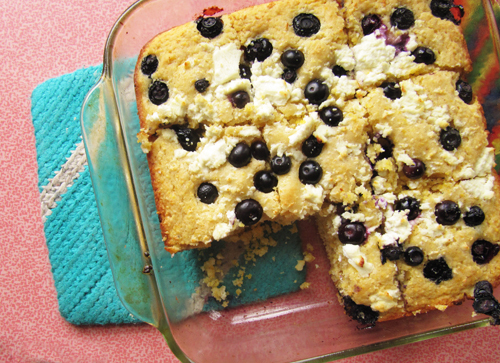 I saw a blueberry cornbread a few months back and pinned it (oh it turns out it was from shutterbean, hah), but your recipe with goat cheese — AMAZING. Love that, pinning this too 🙂 Thanks for a great recipe!